Antrodia camphorata is a unique mushroom of Taiwan, which has been used as a traditional medicine for protection of diverse health-related conditions. In an effort to translate this Eastern medicine into Western-accepted therapy, a great deal of work has been carried out on A. camphorata. This review discusses the biological activities of the crude extracts and the main bioactive compounds of A. camphorata. The list of bioactivities of crude extracts is huge, ranging from anti-cancer to vasorelaxation and others. Over 78 compounds consisting of terpenoids, benzenoids, lignans, benzoquinone derivatives, succinic and maleic derivatives, in addition to polysaccharides have been identified. Many of these compounds were evaluated for biological activity. Many activities of crude extracts and pure compounds of A. camphorata against some major diseases of our time, and thus, a current review is of great importance. It is concluded that A. camphorata can be considered as an efficient alternative phytotherapeutic agent or a synergizer in the treatment of cancer and other immune-related diseases. However, clinical trails of human on A. camphorata extracts are limited and those of pure compounds are absent. The next step is to produce some medicines from A. camphorata, however, the production may be hampered by problems related to mass production. Botanical polysaccharides: macrophage immunomodulation and therapeutic potential. Botanical polysaccharides exhibit a number of beneficial therapeutic properties, and it is thought that the mechanisms involved in these effects are due to the modulation of innate immunity and, more specifically, macrophage function. In this review, we summarize our current state of understanding of the macrophage modulatory effects of botanical polysaccharides isolated from a wide array of different species of flora, including higher plants, mushrooms, lichens and algae. Overall, the primary effect of botanical polysaccharides is to enhance and/or activate macrophage immune responses, leading to immunomodulation, anti-tumor activity, wound-healing and other therapeutic effects. Furthermore, botanical and microbial polysaccharides bind to common surface receptors and induce similar immunomodulatory responses in macrophages, suggesting that evolutionarily conserved polysaccharide structural features are shared between these organisms. Thus, the evaluation of botanical polysaccharides provides a unique opportunity for the discovery of novel therapeutic agents and adjuvants that exhibit beneficial immunomodulatory properties. Ayurveda, the traditional Indian medicine (TIM) and traditional Chinese medicine (TCM) remain the most ancient yet living traditions. There has been increased global interest in traditional medicine. Efforts to monitor and regulate herbal drugs and traditional medicine are underway. China has been successful in promoting its therapies with more research and science-based approach, while Ayurveda still needs more extensive scientific research and evidence base. This review gives an overview of basic principles and commonalities of TIM and TCM and discusses key determinants of success, which these great traditions need to address to compete in global markets. Copyright statement: Copyright © 2011 M. Geethangili and Y.-M. Tzeng. 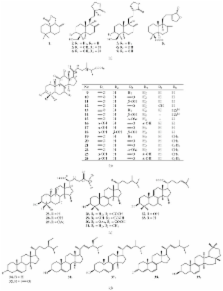 Inhibition of acetylcholinesterase by a pseudozoanthoxanthin-like compound isolated from the zoanthid Parazoanthus axinellae (O. Schmidt). The Ca(2+)-transport-ATPase of human erythrocytes as an in vitro toxicity test system--acute effects of some chlorinated compounds.